The Indian Navy's young and potent MiG-29K fleet gives their long-awaited aircraft carrier, the INS Vikramaditya, a serious punch. 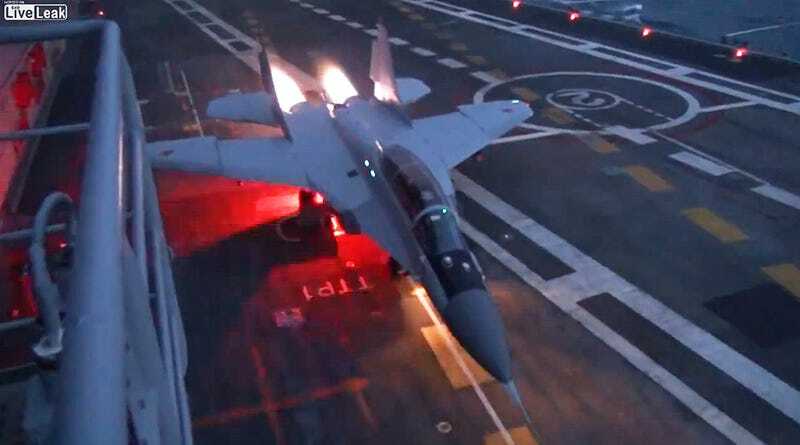 India remains committed to simpler ski-jump instead of catapult configured carriers, and what is not great for a fighter's range and payload is fantastic for visuals, as you can see in the video below. In many ways, the MiG-29K is the ultimate comeback kid. The earliest version of this MiG-29 Fulcrum derivative first flew in 1988. After the fall of the Soviet Union there were no funds available to field two carrier fighters for what was then Russia's rusting navy. Mikoyan and Gurevich continued to tinker with their carrier capable MiG-29 over the years and by the mid 2000s, when India came shopping for a fixed wing aircraft carrier, the Mig-29K suddenly leaped back into life. During India's initial evaluations, the MiG beat out the current operational Russian naval fighter, the gargantuan Sukhoi SU-33. After negotiating the refitting and purchase of the derelict Russian carrier Admiral Gorshkov, India also purchased 16 highly evolved MiG-29Ks to fly off of it. As the program matured, India doubled down on the MiG-29K with another order of 25 examples. Russia, as part of its revitalization of its expeditionary forces, is also now ordering the MiG-29K to be deployed on its own carrier, the Admirial Kuznetsov, replacing the big but dated SU-33 entirely. 24 examples will be delivered to the Russian Navy by the end of 2015, although this number could substantially grow over time if Russia actually realizes its plans for expanded its naval power projection capabilities by adding additional aircraft carriers. At this time, such a proposition is still a paper one, but the MiG-29k is seen as the aircraft that Russia would build a multi-carrier force around. It is very exciting to see the MiG-29 line continue to evolve and thrive in what is a very fickle and crowded international marketplace for fighter aircraft. The MiG-29K is a very different machine than its legacy brethren, even from the first prototype aircraft that took the designation some 26 years ago. The MiG-29K features a totally redesigned wing and leading edge root extension, beefier landing gear, a modern glass cockpit and the proven and upgradable Zhuk-ME radar. It also carries much more gas than the "legacy" MiG-29 (40% more internal fuel), includes a full fly-by-wire flight control system, has true multi-role capability and includes a high-degree of sensor fusion, at least for a Russian design. All of this comes in a package with the ruggedness that is a hallmark of MiG designs. As a comparison, the MiG-29K is very roughly analogous to something between an F/A-18C/D Hornet and a early block F/A-18E/F Super Hornet. In the end, the MiG-29K seems like a rational mix of capability, size and cost (unit cost around $32M). It also offers the multi-role capability, relatively advanced weaponry and ability to act as a buddy tanker that have been lacking in past Russian naval fighter designs. Still, I would love to know what type of actual payload and range envelopes these machines can achieve when working off of ski-jump equipped aircraft carriers. Regardless of the MiG-29K's actual combat radius or its ability to lift heavy loads off the boat, once it is airborne it represents a formidable and modern threat.